Sara Coles is a guest web-writer for Catalysis Science & Technology. 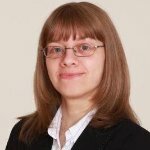 She currently works for Johnson Matthey in Royston, UK. Sulfur is normally thought of as a catalyst poison – but a Perspective article in Catalysis Science and Technology, by Alan McCue and James Anderson at the University of Aberdeen, UK, reports on a growing quantity of work suggesting that it can act as an activity promoter or selectivity modifier in heterogeneous catalysis. 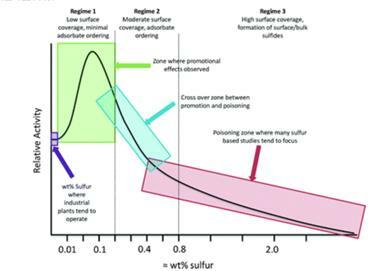 Catalytic metals including rhodium, platinum and palladium are well known for being susceptible to sulfur as a poison, however the effect is perhaps not as simple as first perceived – it has been suggested that the effects of sulfur have a degree of long range character, indicating that a small quantity of adsorbed sulfur may have a disproportionate effect on catalytic properties. Many industrial feedstock s and even biomass derived feedstocks contain sulfur to some extent which may influence catalytic performance. With more than 100 references, this article may provide a useful source of further information on this very relevant topic. The authors present examples from Fischer–Tropsch synthesis, catalytic reforming, regio- and chemoselective hydrogenation as well as CO oxidation, hydrocarbon oxidation and NOx reduction. Gold-palladium nanoparticles are hot stuff when it comes to catalysis. Catalysis Science and Technology’s themed issue, entitled ‘Gold Catalysis’, highlights just three examples of the many studies that regularly appear in the literature. A minireview from Pasi Paalanen et al., Utrecht University, gives an overview of recent developments in the synthesis of supported gold-based bimetallic nanoparticles for catalytic applications. They focus on three major structural features to be characterised and, where possible, controlled: size, composition and nanostructure. They highlight selected literature examples in which gold-palladium nanoparticles were found to be active for reactions such as CO oxidation, vinyl acetate synthesis, cyclotrimerization of acetylene to benzene, selective oxidation of alcohols to aldehydes or ketones, direct synthesis of hydrogen peroxide, hydrocarbon hydrogenation, oxidation of primary C–H bonds, hydrodechlorination and hydrodesulfurization. Meanwhile Elena Corbos and her colleagues at Johnson Matthey Technology Centre, in collaboration with Synchrotron Soleil, France, and University College London, present some original research on the preparation of bimetallic PdAu nanocatalysts. They tested the catalysts for the selective hydrogenation of 2-chloronitrobenzene to 2-chloroaniline and the direct formation of hydrogen peroxide. They found that a Pd-rich surface offered superior selectivity and reaction rates for 2-chloronitrobenzene hydrogenation, while for hydrogen peroxide synthesis, an optimal quantity of gold was required to ensure high productivity. Tatsumi Ishihara et al., Kyushu University, Japan, carried out synthesis of hydrogen peroxide by direct oxidation of hydrogen in air on gold-palladium/titania. They report that the H2 conversion and H2O2 selectivity were strongly affected by the crystal phase of the titania. With increasing H2 pressure, H2O2 selectivity increased on AuPd/rutile TiO2 and the yield of became higher than on brookite or anatase TiO2 at 1.0 MPa. The effects of fluorinated hydrocarbon addition to reaction media were also studied. Find out more about all this research in Catalysis Science and Technology. 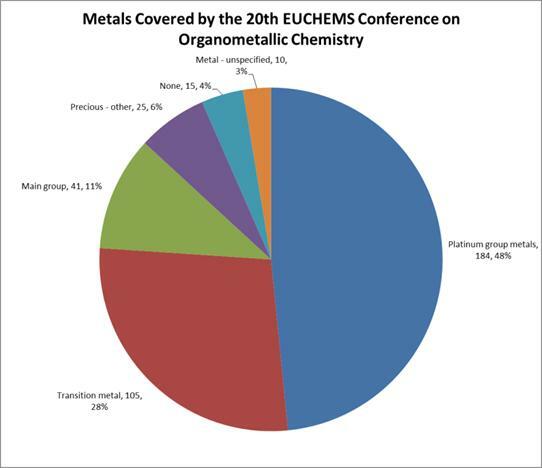 The 20th EuCheMS Conference on Organometallic Chemistry was held from 30th June–4th July 2013, and co-sponsored by the RSC’s Catalysis Science & Technology and Dalton Transactions. This was the main international European conference on organometallic chemistry for 2013 and attendees came from all over the UK, Europe and further afield (notably the USA, Japan and various African countries). Palladium and ruthenium were by far the most represented metals. The presenters were split between those primarily studying fundamentals such as mechanism or characterisation techniques, and those with a focus on practical applications. Several were sponsored or supported by industrial or commercial companies, and others were clearly interested in developing commercialisable products. During the poster sessions, it was clear that some of the students were thinking about industry either in terms of their careers or of commercialising the products that they were working on. Popular catalytic themes included synthesis of novel compounds and complexes; the improvement of existing routes (including some current industrial processes); and waste reduction. Several presenters mentioned valorisation of waste biomass, a hot topic in the current climate. The cost of catalysts came up a few times. Often, though, the cost of the catalytic metal is secondary to other factors such as the cost of the ligand or of ultrapure solvents or reagents that must be added. It does not always follow that an expensive metal means a more expensive process – in fact the reverse is often the case. The conference was well attended and the main lecture theatre was full for the final presentation (by Bruno Chaudret, Institut National des Sciences Appliquées, Toulouse, France) at the end of day three. There was standing room only and the mood was exuberant after an inspiring three days. There was an unscheduled additional presentation for Professor David Cole-Hamilton, of the University of St Andrews, in celebration of his long career in chemistry. The RSC prepared a special issue of Dalton Transactions, co-ordinated by Professors Duncan Bruce and Derek Woollins. Poster prizes were judged by the Young Plenary lecturers and were presented by Professor Dr Eric Meggers. There were nine winners and the prizes were books on organometallic chemistry contributed by Springer and the RSC. The social activities included a musical interlude following Professor Ei-ichi Negishi’s presentation on Sunday evening. This was followed by a whisky tasting on Monday and to finish off the conference in style on Wednesday evening, a banquet and Scottish ceilidh were held in the glorious Scottish sunshine in the famous Old Course Hotel of St Andrews. For those who were able to stay, there was an additional morning of chemistry at the RSC Awards Symposium on Thursday 4th July. The 21st EuCheMS meeting will be held in Bratislava, Slovakia, from 5th–9th July 2015 and is being co-organised by the Czech and Slovak chemistry societies. The website is www.eucomcxxi.eu and will contain more information shortly. Porous carbon nanostructures can be excellent catalyst supports, especially for nanoparticles of noble metals such as palladium. A paper co-authored by Maiyong Zhu and colleagues, in China, describes the use of pre-synthesised α-Fe2O3 nanoparticles as templates to form hollow carbon ‘nanonets’ on which palladium nanostructures are deposited by an in situ precipitation-reduction procedure. The advantage of the hollow nanonet structure is that a higher catalyst loading can be achieved, potentially leading to greater activity towards the target reaction. The researchers tested their supported palladium catalysts for the Suzuki and Heck coupling reactions, with good yields although the conversions of substituted substrates tended to be lower than unsubstituted ones. The reactions could also be carried out in water – good news for ‘green’ chemistry. Compared to supports based on solid carbon spheres, the nanonet supported catalysts had slightly higher palladium loadings and considerably better catalytic performance. The group have also confirmed through experimental methods that the reactions are indeed catalysed by the supported palladium and not by any leached palladium in solution. The catalysts could be recycled, though there was some loss of activity. Analysis showed that after the Heck reaction, in particular, there was significant aggregation of palladium nanoparticles, thought to be due to temperature effects, as well as deformation of the nanonet carbon structure. currently works for Johnson Matthey in Royston, UK. Foam, fleece and honeycomb have one unexpected thing in common: they are all physical structures that can be made into supports for industrial platinum catalysts. Patrick Sonström and colleagues in Germany have studied the deposition of colloidally preformed nanoparticles of platinum deposited with or without a washcoat onto low surface area codierite honeycombs, alumina foam and nickel fleece. Their technique allows higher platinum loadings to be applied without the disadvantages of agglomeration and adhesion, meaning that higher catalytic activities can be achieved on low surface area substrates. This could have potential to expand the use of monolithically supported platinum catalysts beyond their automotive niche and into wider industrial use for reactions such as methanol steam reforming, oxidative dehydrogenation of propane and liquid phase hydrogenations. The advantages of monolithic catalysts over their classic pellet bed alternatives include lower pressure drops and improved mass transfer. Shape controlled synthesis of catalytically active metal nanostructures is an important field of scientific research for both industry and academia. The arrangement of atoms on the particle surface is believed to play a critical role in the adsorption and desorption of substrates and products – which in turn affects the activity and selectivity of the catalyst. The chance to fine-tune these properties is too good to miss. With this aim in mind, Sourov Ghosh and colleague, working in India, have experimented with different ways to shape platinum nanoparticles. Their report in Catalysis Science & Technology explains how they made and characterised ‘peanut-like’ and ‘dendrimer-like’ platinum nanoparticles to compare their performance in the hydrogenation of unsaturated alcohols and, supported on carbon nanotubes, in the oxygen reduction reaction (ORR). The peanut-like particles showed significantly higher specific activity towards the ORR than the aggregated dendrimer-like particles or conventional quasispherical platinum nanoparticles. This makes them a promising choice for the fuel cell cathode due to their ability to promote faster electron transfer kinetics. Read more about this work in the full paper. Biomass is the ‘next big thing’ in chemicals production. The goal is to take cheap lignocellulosic feedstocks and convert them into high-value chemicals or even fuels. A step in this direction has been taken by James Dumesic et al. at the University of Wisconsin-Madison, USA. They wanted to make levulinic acid (LA), a useful precursor to many kinds of industrial chemical including gamma-valerolactone (GVL), a potential green solvent and biofuel, which is also used in the perfume industry. One major problem with converting cellulose to LA is the lack of solubility of both the feedstock and the reaction’s unwanted byproducts. Dumesic’s team used a solvent system of 90% GVL and 10% water which allowed the cellulose to be converted to fully soluble products, and prevented the precipitation of solid humin byproducts which can make catalyst separation tricky. The polymer Amberlyst 70 proved to be the best catalyst, producing 69% LA from pure cellulose after 16 h. Importantly it also performed well using a ‘real’ biomass feedstock, corn stover. After filtration to remove the Amberlyst 70 the LA product was upgraded to GVL by hydrogenation over a ruthenium-tin catalyst, with no need for neutralisation or purification steps. This process simplification could make it a promising approach for the manufacture of added-value chemicals such as GVL from lignocellulosic biomass.